Forge wil be closed to members for the afternoon. 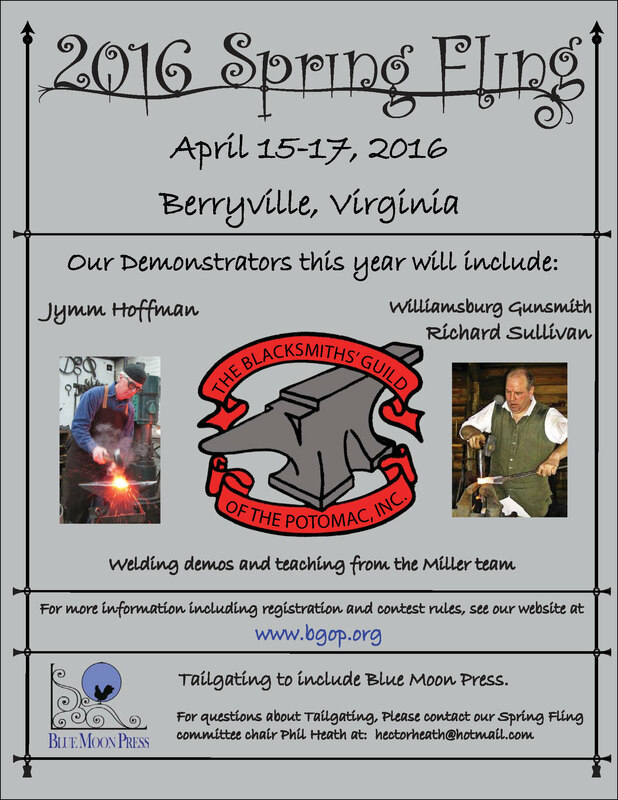 BGOP Spring Fling: Berryville, VA.
Tour of the new location is planned as a second half of the meeting. 9:00-5:00 PM Demonstrators welcomed - George Anderton is the Coordinator. 4-H Fair/Frying Pan Park Farm Show:Herndon, VA. July 31- August 3. Frying Pan Park web site http://www.fairfaxcounty.gov/parks/fpp/. 7:30 P.M. Gas Cutting, Keith Kuck is cancelled, We will have an open forge. 9:00-5:00 PM Demonstrators Needed - George Anderton is the Coordinator. Web site HERE. Demonstrators needed. Skip is now the Guid Contact for this event.